Opponents of President Trump’s executive orders concerning immigrants and refugees plan to rally at the Oregon State Capitol on Wednesday. Last Friday, President Trump suspended the U.S. refugee program for 120 days, banned all immigrants from seven Muslim countries — Syria, Iraq, Iran, Somalia, Sudan, Yemen, and Libya — for 90 days, and ordered his administration to develop “extreme vetting” measures for immigrants from those countries to keep “radical Islamic terrorists” out of the United States, as reported by USA Today. A protest against the orders was held at the Portland International Airport Sunday. “We wanted to be an encouragement to President Trump for keeping his promises to the American people,” Steve said. At first, Steve said he and his wife ran into resistance from some protesters, but as they spoke to them, they found common ground. Doug and Anya Holcomb, founders of Salem for Refugees, said they are going to continue to provide services for locals impacted by the actions. 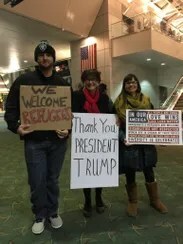 “In the coming days, our focus will be on caring for the refugees who are already in Salem, advocating for the 65.3 million people across the globe who have been forced to flee their homes, educating our community about the global refugee crisis, and preparing our city to welcome the refugees who will be coming when resettlement begins again,” the two activists said in a statement. Jim Ludwick, communications director for Oregonians for Immigration Reform, said the organization saw the president’s actions as a hopeful sign of Trump keeping his promises. “We were hopeful that President Trump will come out and build the wall, and we think he will,” he said. Oregonians for Immigration Reform, Ludwick said, is not against all immigration; rather, it is in favor of stricter background checks and a lower volume of people brought in each year. “We need to make sure the people who come in are the people they say they are,” he said. Aside from violent attacks, he said the country isn’t able to sustain much more than 230,000 legal immigrants a year. “We aren’t able to sustain (the number of people now), environmentally, socially, financially or politically,” he said. He said multiple U.S. Presidents in the past, including Carter and Clinton, placed travel and immigration bans on certain areas. “This is not a new thing — there are just new players,” he said.